The most anticipated twins have arrived. Brad and Angelina are the new parents of a boy name Knox Leon and a girl called Vivienne Marcheline. Any parent will tell you that babies are more precious than anything else in the world. We know that the twins born last Saturday in Nice, France will bring joy to the couple, their siblings and be well loved by all. From the looks of the crowds standing outside the hospital the twins already have their own fans. Knox and Vivienne could just be as precious as another brother and sister who have been loved by all their fans for nearly 95 years. 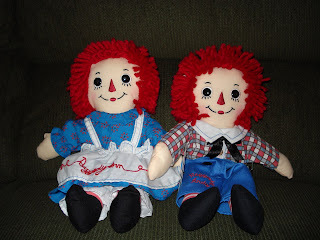 Raggedy Ann and Raggedy Andy looking as cheerful as they did when they were introduced to adoring fans nearly 95 years ago.